2. I've been drinking mostly sencha, which I find hard to write about (unlike this guy). 3. Hell, I'm just lazy. Anyway, in an attempt to appease you, here are two mini-reviews of two (enough with the numbers already!) senchas I've been enjoying lately. Great stuff. Bold, sweet, round flavor, and light on grassiness and astringency. If you like O-Cha's Yukata Midori, you will like this too. I would say it definitely has a stronger flavor than the Yukata Midori and its color is almost as rich, though it is not quite as sweet and lacks a certain something I can't put my finger on. Though not as good as O-Cha's Hatsumi, I think this is a great performer for its price. Like the Hatsumi and Yukata Midori from O-Cha, this is a mellow sencha. It is not devoid of grassiness, but it is certainly downplayed in favor of the sweet "greenness" that I find so difficult to describe any better. (I should mention that when I say "mellow," I do not mean "light.") This is a full-bodied tea with good flavor, and would be a great daily sencha. If you happen to have a Lupicia store nearby (there are not many, unfortunately), check it out. I visited the one in San Jose, CA, and was quite impressed. Not only did they have a huge selection of teas (mostly Japanese greens), but they also had helpful, friendly workers— a breath of fresh air, per se, for one who has sore memories of hubris-filled Teavana "teaologists." Well, that's all, folks. Stay tuned though, especially you tea-newbies. I have something very special lined up that you won't want to miss! I'm glad you got to try out a Lupicia. I agree that it's so unfortunate that they have so few stores, and they're all somewhat clustered. I'm finding that a lot of Lupicia teas aren't stellar performers, although some are, but very good value teas for their price. That's also an amazing pen you've got there. My parents just got back from Hawaii. On their last day, they called me from the Lupicia store, and I ordered an Uji sencha and fukamushi. The knowledgeable staff recommended a gyokuro that I have been greatly enjoying. If they had a store around here, I would be a constant visitor -- their product is fresh and tasty. I also got a 2oz bag of their Wenshan Baozhong, which I have yet to try. Hopefully it's good, but as it is a Japanese shop, I'm not expecting a whole lot. The pen is a Waterman Hémisphère. It's my first fountain pen, and it's actually not *terribly* expensive. I wouldn't call it cheap, but I got a good deal (~$40) on it at a local shop. I was pretty impressed with the freshness of the tea, too. Especially since I got it from one of their physical stores, I expected it to have been sitting out for a while. A lot of their teas were sold out, which seems to suggest that they only keep a limited stock in store at any time. Also, which sencha did you get? I may have to try it. 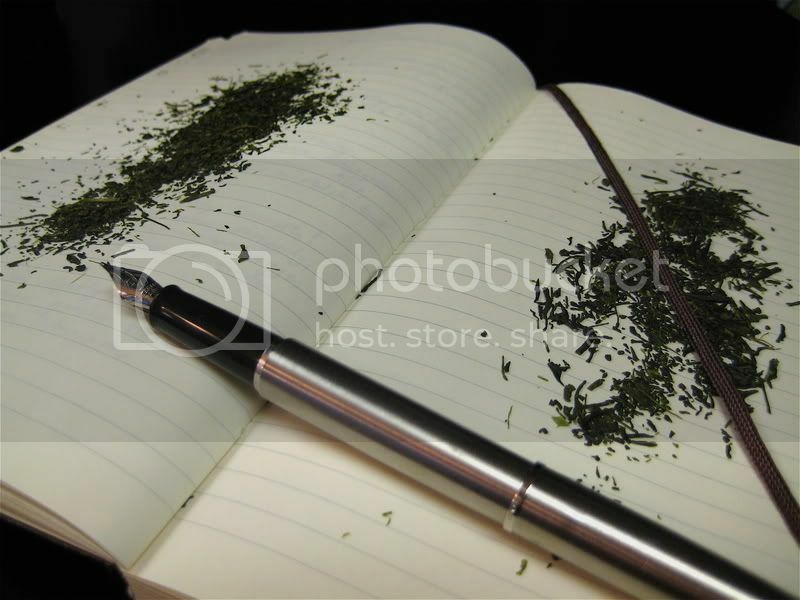 The sencha on the pages was an excellent photo! Great review as well! Thanks for the compliments! They are much appreciated. What happens when you neglect your tea tray?